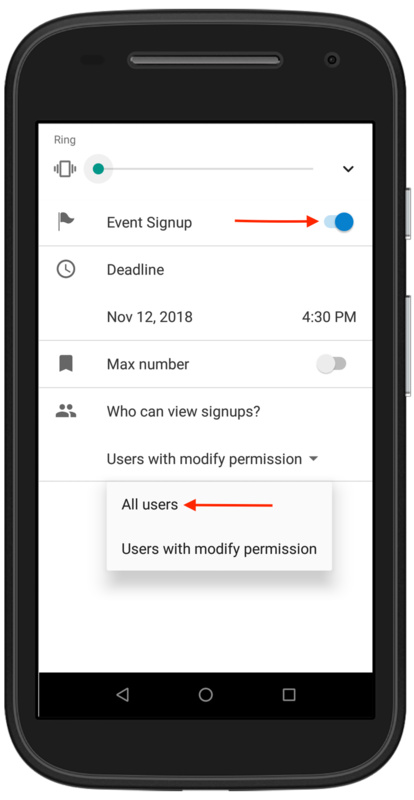 Use event signups to get an accurate headcount, set a limit on the number of participants, and collect participant information for follow-up. It’s easy. Event signups are a built-in, powerful feature available at all subscription levels. If signups are enabled, people can sign up for an event with their name and/or email address. The event organizer(s) can easily see who has signed up. Enabling signups on events is a quick process. On a browser: open any event, click the Options button, and choose Signups. In the dialog window that opens, toggle Event Signups to enabled. You can adjust the signup deadline and set a maximum number of signups permitted. Choose who can see the signups (All users or Users with modify permission). Click the Done button, then Save the event. On the Teamup mobile apps: open the event and tap Edit in the top right corner. Tap the gear icon to access the event options, and select Signup. Toggle on Event Signup, then set the options as desired. 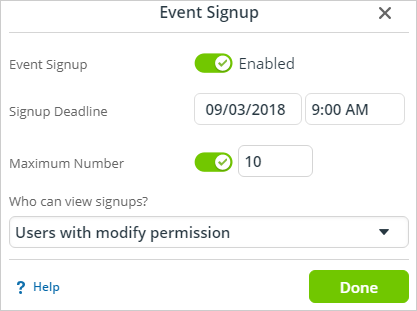 When choosing who can view event signups, you can choose between All users or Users with modify permission. If you choose All users, email addresses of participants will be automatically hidden on the signup list, which will show at the bottom of the event editor/viewer, and on the event page. 1. Organize community events and prevent duplicate signups. Many organizations and groups use Teamup for community calendars. Some of these calendars are available only to group members, and some are public-facing. In many cases, multiple organizations share a calendar so that community members can see all the area events in one place. 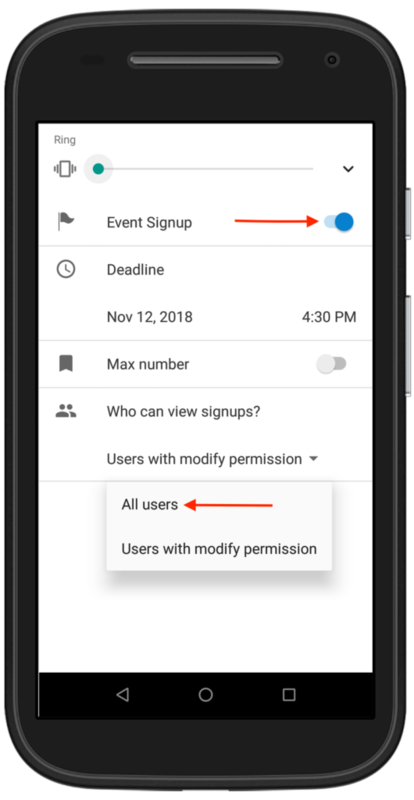 The signup feature makes it easier for event organizers to get an accurate idea of interest or limit the number of participants. Enable Signup on any event, set a deadline, and set a maximum number if space is limited. Or, if you have plenty of room but want to have a headcount in order to prepare adequate materials, food, or other supplies, don’t set a maximum number but do require a deadline. Participants can enter a name, an email address, or both to signup for an event. In order to prevent duplicate signups, the email address must be unique. If only a name is used, the name must be unique. 2. Promote events and manage the number of participants. 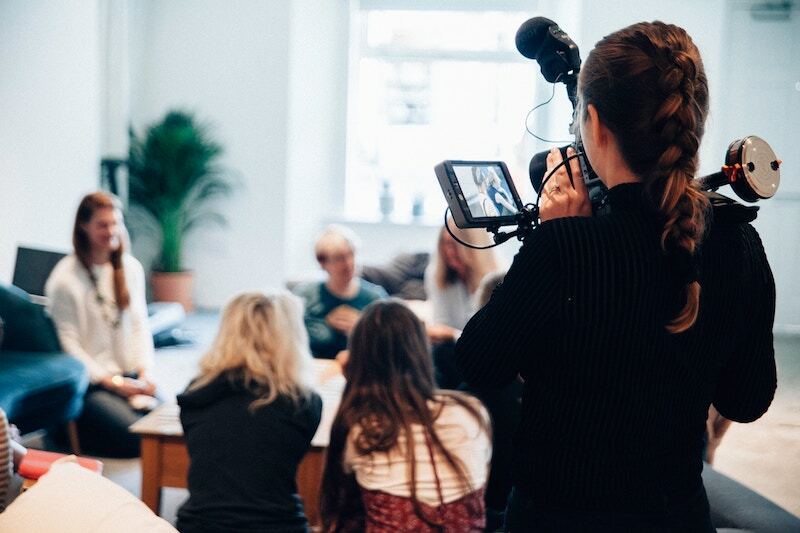 Many Teamup users have found that their Teamup calendar works well as a simple booking system for workshops, classes, seminars, and training sessions. In most of these scenarios, it’s important to know how many people want to participate. In many cases, it’s key to be able to limit the number of participants per event. 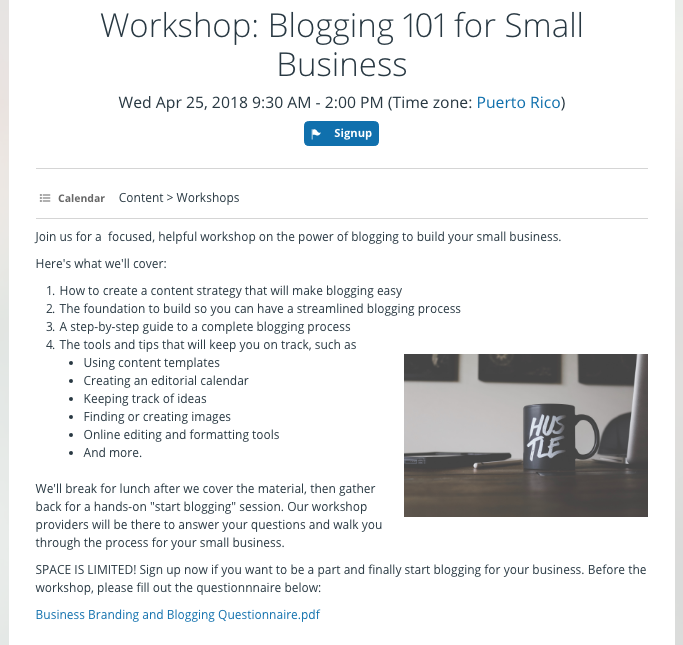 Create the event for your workshop or class, then enable Signups and set the deadline, giving yourself enough time to make arrangements or adjust logistics as needed. Then, if needed, set the maximum number to limit signups to what you can accommodate. Easily promote your workshop by sharing the event as a page across all your social media platforms or to an email list. Interested people can signup from the event page, and you can get notifications when anyone signups. Set up your Notifications to include ‘All changes’ to receive an email when someone signs up. 3. Gather and export participant contact information. 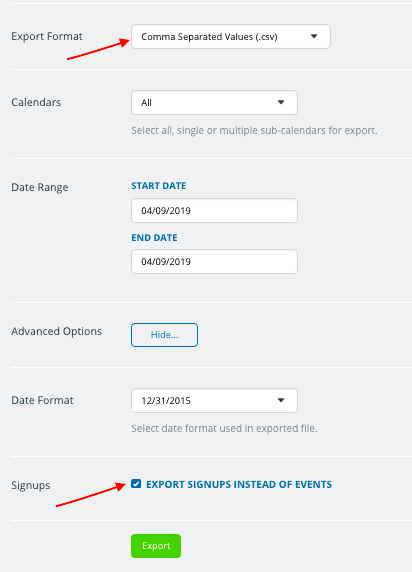 You can also export signup information from all or some of your sub-calendars. To do so, go to Settings > Export Events. In the Export Format, choose Comma Separated Values (.csv). Scroll to Advanced Options and click Show. Check the box to Export signups instead of events. Choose the calendars and date range as desired, then click Export. The signup information will download in standard .csv format, so you can easily sort and work with it as needed. If event signups work well for you, you can enable them by default so that all events will automatically have signups enabled. You can override this global setting on individual events. To enable event signups globally, go to Settings > Event Fields. Click the Edit icon on the Signups event field. Scroll to the Defaults section. Choose the options you want for default Signup settings. If you don’t have a Teamup calendar yet, you can create your own now (it’s free!) or try out a live demo calendar to see how it all works.